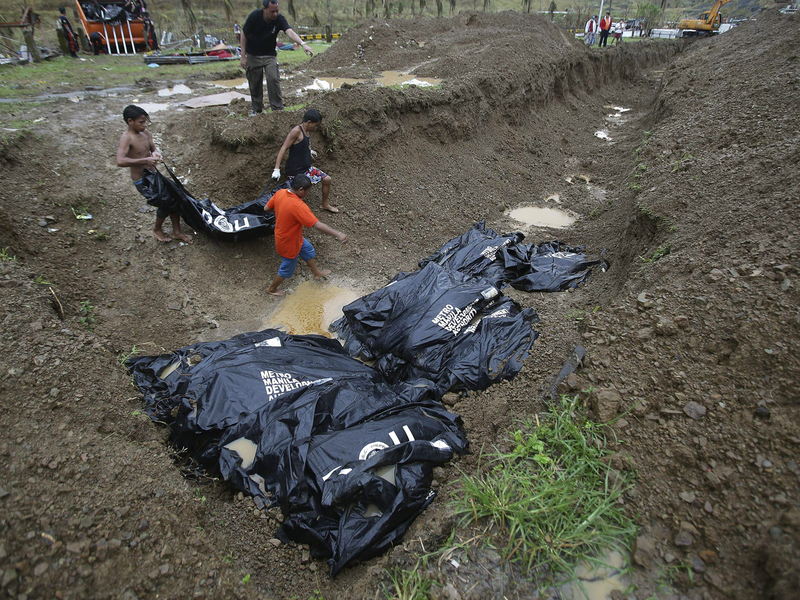 TACLOBAN, Philippines - The air was thick with the stench of decay as sweating workers lowered the plastic coffins one by one into a grave the size of an Olympic swimming pool. Scores of unidentified bodies were interred together Thursday in a hillside cemetery without any ritual - the first mass burial in this city shattered by last week's Typhoon Haiyan. Six days after the disaster, some progress was being made in providing food, water and medical aid to the nearly a million people displaced in the Philippines. Massive bottlenecks blocking the distribution of international assistance have begun to clear. Soldiers on trucks gave out rice and water, and chainsaw-wielding teams cut debris from blocked roads to clear the way for relief trucks in Tacloban, the capital of the hardest-hit Leyte province. Thousands of people continued to swarm Tacloban's damaged airport, desperate to leave or to get treatment at a makeshift medical center. "We know the gravity of our countrymen's suffering, and we know that, now more than ever, all of us are called on to do whatever we can to help alleviate our countrymen's suffering," President Benigno S. Aquino III said in a statement. CBS News correspondent Seth Doane reports from Tacloban that its government-run hospital is on life support. Dr. Lory Reutas told Doane the hospital normally sees 100 patients a day, but since the typhoon that number has soared to a thousand. Because the hospital doesn't have electricity, Reutas said hospital workers have had to sew stitches by candlelight. Obama: Devastation in Philippines "heartbreaking"
Authorities say 2,357 people have been confirmed dead, a figure that is expected to rise, perhaps significantly, when information is collected from other areas of the disaster zone. With sweat rolling down their faces, John Cajipe, 31, and three teenage boys who work at the Tacloban cemetery placed the first body in the grave's right-hand corner. The second body followed two minutes later, carefully placed alongside the first. And so on, until scores of coffins filled the 6-foot deep grave. A ritual to sprinkle holy water on the site is expected to be held Friday, one week after the typhoon struck. A portion of the femur was removed from each corpse by the National Bureau of Investigation. Technicians will extract DNA from each bit of bone to try to identify the dead, said Joseph David, crime photographer for the bureau. "I hope this is the last time I see something like this," said Mayor Alfred Romualdez. "When I look at this, it just reminds me of what has happened from the day the storm hit until today." The massive flow of international aid was bolstered by Thursday's arrival of the USS George Washington in the Philippine Sea near the Gulf of Leyte. The aircraft carrier will set up a position off the coast of Samar Island to assess the damage and provide medical and water supplies, the 7th Fleet said in a statement. The carrier and its strike group together bring 21 helicopters to the area, which can help reach the most inaccessible parts of the disaster zone. The United Kingdom also is sending an aircraft carrier, the HMS Illustrious, with seven helicopters and facilities to produce fresh water, Britain's Ministry of Defense said. It said the ship is expected to reach the area around Nov. 25. The U.S. already has a half-dozen other ships - including a destroyer and two huge supply vessels - in the area, along with two P-3 aircraft that are being used to survey the damage so that planners can assess where aid is most needed, the 7th Fleet said. "We are operating 24-7," said Capt. Cassandra Gesecki, a spokeswoman for the Marines, who have set up an operations hub near Manila's international airport. "We are inundated with flights." Valerie Amos, the U.N. humanitarian chief who toured Tacloban on Wednesday, said about 11.5 million people have been affected by the typhoon, which includes those who lost loved ones, were injured, or suffered damage to their homes or livelihoods. "The situation is dismal. ... Tens of thousands of people are living in the open ... exposed to rain and wind," she told reporters in Manila. She said the immediate priority for humanitarian agencies in the next few days is to transport and distribute high-energy biscuits and other food, tarpaulins, tents, drinking water and basic sanitation services. "I think we are all extremely distressed that this is Day 6 and we have not managed to reach everyone," she said. Amos said because of a lack of fuel in Tacloban, trucks are unable to move the aid material from the airport to the city. The weather also remains a challenge, with frequent downpours. The good news is that the road to the airport has been cleared of debris, she said. On Wednesday, the U.N.'s World Food Program distributed rice and other items to nearly 50,000 people in the Tacloban area. Nearly 10 tons of high-energy biscuits were also delivered to the city on Wednesday, with another 25 tons on the way. But for thousands of people who have squatted in Tacloban's sports arena, known as the Astrodome, no aid has arrived since the typhoon struck. A volunteer from the village council handed out only stamps for food that is yet to be seen. The first nighttime flights - of C-130 transport planes - finally landed since the typhoon struck, suggesting air control systems are now in place for an around-the-clock operation, a prerequisite for the massive relief operation needed. Tacloban city administrator Tecson Lim said 70 percent of the city's 220,000 people are in need of emergency assistance, and that only 70 of the city's 2,700 employees have been showing up for work. He also stuck to an earlier estimate that 10,000 people had died in Tacloban even though Aquino has said the final death toll would top 2,500. Philippine Energy Secretary Jericho Petilla said it may take six weeks before the first typhoon-hit towns get their electricity back. In Tacloban, order needed to be restored "because if there's no peace and order, it's hard to reinstall the power posts," he said.